Prepare two bowls. In one, crack open two eggs, add a pinch of salt and beat with a fork or whisk. Pour plant-based milk in the other bowl. Take a slice of stale bread and dip it in milk. Let it soak up the liquid, turning on both sides. Then, place the milk-soaked bread slice in the beaten eggs, again turning on both sides. Heat a skillet or pan on medium and add a bit of coconut fat (or butter or oil). Place bread slice in a hot pan and fry for a couple of minutes, then turn on the other side and fry for another couple of minutes, until both sides are golden brown and crispy. Remove bread slice from pan and set aside on a plate, covered with a paper towel to soak up excess fat. Repeat until you've used up all bread slices. 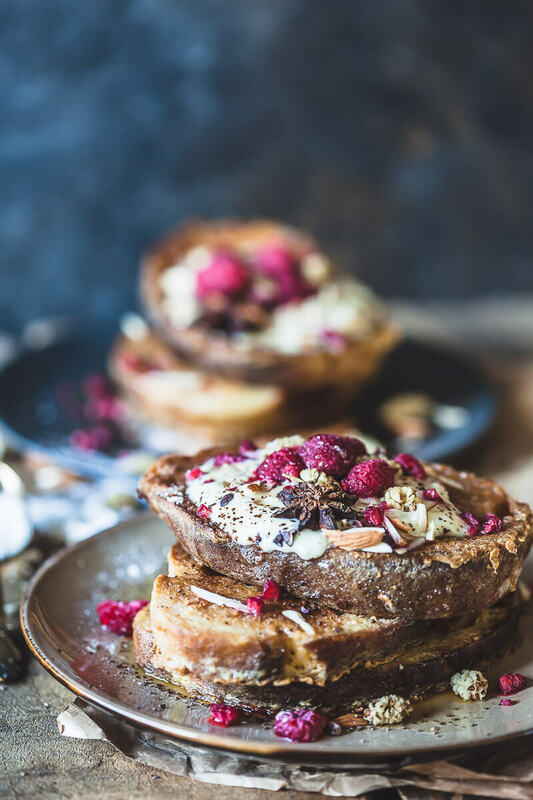 Place you french toast on a plate and top with maple syrup, some vanilla-flavored soy yogurt, frozen raspberries, dried mulberries, cacao nibs and chopped up almonds. Serve.